Look how I did on my black walnut harvest! – Let's Paint Nature! Look how I did on my black walnut harvest! Just keeping it real folks. Remember how excited I was last summer to harvest black walnuts and how I can see myself living off the land, yadda, yadda, yadda, oh boy…. I should have started with something a little bit more easy. After hours of getting the husk off with my husband’s old boot and staining the garage floor (yeah…he’s not happy) resulted in about 40 walnuts. After soaking them in a pot of water to see which ones sunk (good meat inside) and which ones floated (bad meat inside, maybe has been eaten by some larva) resulted in 12 walnuts. Oh well I thought, I’ll put it in salad at least. After drying for a few months I struggled to open one with A HAMMER BECAUSE IT’S SO DARN HARD TO GET THEM OPEN…..sorry for yelling…and the meat was bad. Shriveled. Good thing I wasn’t feeding my family or anything! Ha ha haaaaaa. I guess I will just leave the black walnuts to my enemy the tree rat (squirrel). You win this time Mr. Tree Rat…this time. 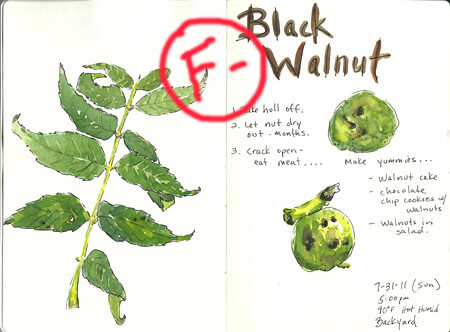 I love walnuts and things made with them, but it’s to easy (but expensive) to buy them. My dad used to spread the walnuts out in the drive way (gravel) and back over them with the car, much easier way to husk them. Thanks! I think I will just stick to painting them instead of harvesting them. LOL. Thank you for a light hearted story to read over breakfast. Though I can’t agree with the F- because you are feeding the hungry of the world … even Tree Rats need to eat. Thank you, you are very kind not to agree with the grade. PS the “minus” is because I predicted all of the yummy things I was going to bake..HAHAHA! oh well! I use them to make dye and ink. No stress over trying to open them! How do those squirrels do it!? I don’t know how the squirrels do it…but they can have it!! Hahahhhhhaaaaahaha! My parents also spread them on the driveway to get the hulls off, then cracked them in the basement on newspaper with a hammer, then picked them one by one while watching TV with a pick! Stored in the fridge and used mostly for cookies and on ice cream. Serious dedication. Very sorry for your bad experience, but it certainly produced a stirring tale– thanks for sharing! P.S. Please remove that failing grade, that’s too pretty a sketch to be defaced that way!! Hi Chris. I also know someone that lays the nuts in the driveway and runs them over with their car to remove the outer layer. It does stain the driveway though. I think you deserve an A+ for effort and a beautiful sketch! Thank you. Yes, I think I need the strength of a car. Or maybe those little tree rats can battle with them. Ha ha haaaaa!!!! Pingback: Backyard Garden Sketch | Let's Paint Nature!